(Nanowerk Spotlight) Individual carbon nanotubes could find exciting applications in nanoelectronics but in order to exploit their intriguing properties on the macroscale, for instance in thin films and membranes, vast numbers of these tubes must be assembled. Resembling paper, these macroscopic aggregates are commonly called buckypaper – extremely thin sheets made from intertwined carbon nanotubes (CNTs). Buckypaper – in which CNTs collectively behave as a random web – is characterized by its optical transparency, mechanical flexibility, high electric conductivity, uniform dimensions, tunable electronic properties, large specific surface area and smooth surface topology. All of which make this a very promising material as functional element or structural component in a wide range of applications such as optoelectronics, nanocomposites, chemical separations, biocompatible platforms, electronics, and energy conversion and storage. So far it has been difficult to simultaneously retain the intrinsic properties of individual CNTs – due to damage – and to have versatility in creating different shapes, both problems unavoidably resulting from post-growth fabrication processes. To date, CNT membranes are mainly prepared using an ancient art of paper making, namely, via the filtration of CNT suspensions in water and then drying of the resulting slurry. A number of alternative fabrication methods of buckypaper have also been reported such as solid-state drawing, spin coating, drop casting, dip casting, and Langmuir-Blodgett deposition. The quality of CNT papers strongly depends on the degree to which the CNTs are pristine, purified and dispersed. This usually requires processes that use strong acids (for purification) and surfactants such as Triton X-100 (for dispersion) in aqueous or organic media, which may not only damage and contaminate the resulting papers, but also leave chemical wastes behind. Therefore, these methods have limitations including poor CNT quality, difficult structure control, and/or low production efficiency, and hence the resulting membranes have not realized the potential mechanical, electrical, and optical properties that individual CNTs can provide. A research group in China has now reported a simple approach for the direct and nondestructive assembly of multi-sheeted, single-walled carbon nanotube book-like macrostructures (buckybooks) of several millimeters in thickness with good control of the nanotube diameter, the sheet packing density, and the book thickness. "The important difference of our approach from other above post-treatment techniques is that single-walled carbon nanotubes (SWCNTs) with uniform and tunable diameters to some extent are directly assembled into macroscopic 2D thin films with uniform and tunable thickness and then into novel 3D multi-sheeted book-like macrostructures we called buckybooks," Hui-Ming Cheng tells Nanowerk. "This is done during a floating catalyst chemical vapor deposition (FCCVD) process that we have used to synthesize CNTs and other carbon nanostructures for years." Since the SWCNTs are not damaged during this in situ assembly process, the as fabricated buckybooks can maximally retain the intrinsic properties of individual nanotubes such as high mechanical flexibility, selective adsorption, and excellent electrical conductivity. 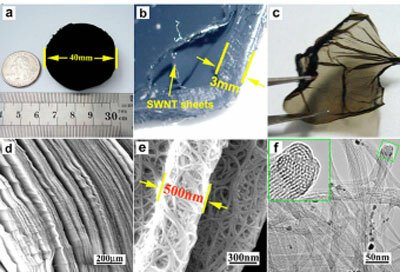 Cheng, a professor at Shenyang National Laboratory for Materials Science and leader of the Advanced Carbon Division, together with members of his group, has published these finding in the February 27, 2009 online edition of ACS Nano (In Situ Assembly of Multi-Sheeted Buckybooks from Single-Walled Carbon Nanotubes). This work is building on a previous paper, also published in ACS Nano, where the group demonstrated that high-quality SWCNTs with tunable diameter distribution and enrichment can be synthesized by the FCCVD method (Diameter-Selective Growth of Single-Walled Carbon Nanotubes with High Quality by Floating Catalyst Method). "The process we used is in stark contrast to existing post-treatment techniques to make paper-like CNT macrostructures" says Cheng. "Owing to the long persistent lengths of SWCNTs with extremely good rigidity, the newly formed SWCNTs floating in the high-velocity gas flow of the FCCVD process can gain maximal overlapping and interpenetration when they are forming networks that can yield excellent mechanical integrity and electrical conductivity." "In addition" he continues, "since the microstructure of SWCNTs is only determined by the growth conditions but independent of the assembly processing, individual SWCNTs with different diameters or semiconducting/metallic electrical properties can be finely tailored and tuned by changing the growth conditions of the SWCNTs for the subsequent assembly of the buckybooks." Interestingly, this approach can be easily extended to assemble various other types of 1D nanostructures such as double-walled or multi-walled CNTs, or other inorganic nanotubes that can be produced by FCCVD into thin sheets, thick books, or even sophisticated sandwich-like hybrid architectures with different functional layers.